For those looking for a family vacation, Grand Strand Resorts offers plenty of two bedroom units and condo rentals in North Myrtle Beach. Search through our array of oceanfront condos perfect for vacationers and golf groups alike. From resort-style luxuries to quietly located second-row units, our selection of two bedroom condo rentals is unparalleled. 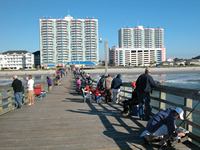 North Myrtle Beach is known for a variety of beach vacation activities. Families and couples each choose the ocean as the perfect backdrop to take a vacation. The area also has additional perks not found in other beach communities. From a world famous dance known as the “shag” to championship level golf courses, the area encompasses many lifestyles. These are some of the factors that make North Myrtle Beach one of the best oceanfront resort vacation destinations. Our two bedroom units and condos in North Myrtle Beach far exceed expectations. The oceanfront condo resorts here such as the Avista, Baywatch and Seawinds pride themselves with providing superb service and accommodations. Expect nothing but the best two bedroom vacation rentals from Grand Strand Resorts. For more information regarding any of our resorts or unit rentals we offer call 800.367.6515. Our goal is to provide the finest rental experience when choosing a North Myrtle Beach vacation.